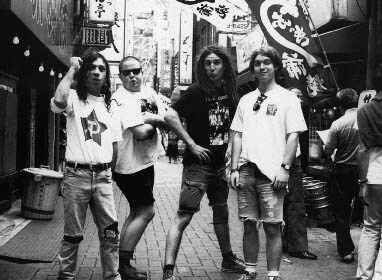 The Meanies are one of the most important Australian bands to emerge from the punk scene down-under. They formed in 1989, and have released more than a dozen records on the Australian label Au-go-go, as well as several more on various labels in the United States, Europe and even Japan, most notably on Munster in Spain and Sympathy For The Record Industry in California. They really get out there as well, with tours already in the United States, Europe and Japan. The Meanies are Linky on vocals, DD on guitar, Taz also on guitar, Wally on bass, and Ringo on drums. Their only eMpTy release, a greatest hits sort of thing with tracks from several of their now hard to find singles. Eighteen tracks, with such stand outs as "Dark Side Of My Mind", "Lyin'" and "Don't Sale".